Comments on something about which I know only a little: the UK election. 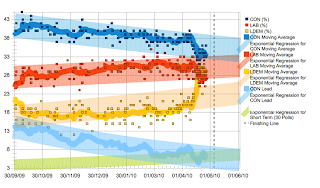 First, from UK Election Trend, polling summaries through today. UK Election Trend analyzes this graph: "It's too close to call, and it seems like there will be no clear answer till the morning of the 7th. It does however look sure to be a hung parliament of some kind. " UK Election Trend is fascinating. It's a bit more analytical and seemingly independent compared to the UK Polling Report, which I also visit a lot. The Tory reaction to a hung Parliament (ditching their planned Party Political Broadcast and doing a pseudo-satire on the horrors of what Clegg and others are humorously calling a "balanced Parliament" ) indicates their utter fear of this outcome. Hilariously, they tried to get Armando Iannucci to direct it. The sentiment of the UK is apparently more left-leaning than the current 2.5 party electoral system reflects. Perhaps a coalition could rework the electoral system to allow voter sentiments to be more closely tracked. A Liberal-Labour coalition could conceivably change the system and create a permanent minority Conservative Party. I'm pleased that I somewhat align with David Mitchell in that impulse. The Tories would rather drink poisoned cider than change the electoral system. Their idea for "more democracy" is referenda and initiatives. Not necessarily awful ideas in themselves but which they plan to implement in a horrific manner (look at California for the wreckage left by such a system). I've been considering why I find this election so fascinating, apart from my rank Anglophilia. I've assembled some reasons. While the election is important to the UK, the outcome is, in all likelihood, of small consequence to my daily life (unless the BBC is affected!). I can enjoy the ins and outs without being emotional about them. It's hard to do that with elections in my own country. By temperament and politics, I find the Tories pretty repellent. Labour seems old and tired. So the game-change that came from Clegg's performance in the first debate was thrilling, especially considering the fact that it happened during the first ever televised leadership debate in the UK. I'd be satisfied if Murdoch took a whacking, and the LibDems aren't tied to Rupert as the other parties are. Murdoch is such a malign influence here in the USA: any comeuppance he gets is a boon to me. And, ultimately, it's exciting, interesting, and a bit exotic. Yes: exotic, to this American. Britain has a notoriously partisan press and I'm largely unfamiliar with the inclinations of the major papers. In order to "consider the source," I've often returned to this handy chart from the Guardian listing the parties the various publications have supported over the decades. Most helpful. Click through for a commendable article about the Guardian meeting regarding their endorsement, as well as a click-sortable (and more legible) version of this table.